I love newspaper films and Cold War movies, and if the two are combined, so much the better. 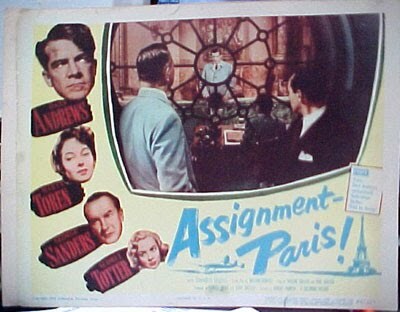 ASSIGNMENT - PARIS isn't in the top tier of either genre, but any film starring Dana Andrews, George Sanders, and Audrey Totter is worthy of being seen. The film should perhaps more appropriately have been titled ASSIGNMENT - BUDAPEST, as it's about the trouble a Paris-based reporter (Andrews) finds himself in when he takes an assignment behind the Iron Curtain in Hungary. (According to IMDb, the film's alternate U.S. title was EUROPEAN EDITION.) 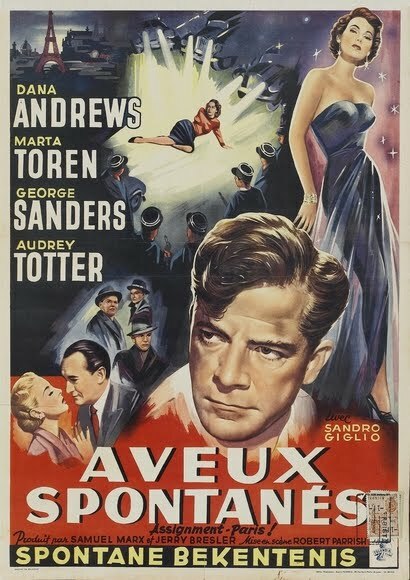 Sanders plays Andrews' editor, who works along with another reporter (played by Swedish actress Marta Toren) to free Andrews when he's jailed by Hungary's Communist regime. Although the types of Communist crimes portrayed in the film were all too real, the bad guys in this film are played too broadly -- one can almost imagine them twirling mustaches as in an old-style melodrama. I didn't care for most of the last third of the film, simply because I don't find it entertaining watching someone be tortured. However, this section does give Sanders a couple great moments to ride to the proverbial rescue, and that's always a good thing. The film has an abrupt ending. It really needed a scene or two to wrap things up -- will Dana Andrews be OK? It seemed as though the screenwriters couldn't think of a good ending following the climactic sequence, so they just stopped where they were. More to my liking were the scenes depicting the operation of the newspaper office, with special phone lines for the reporters in various European offices and the reporters' stories being broadcast within the office, as well as tape-recorded for transcription. Andrews and Sanders can do no wrong, to my way of thinking, and I especially love Sanders when he plays one of the good guys. (My favorite Sanders role is ffolliot in 1940's FOREIGN CORRESPONDENT.) Unfortunately fabulous Audrey Totter doesn't have much to do other than look stylish and carry a torch for Sanders, who's attracted to reporter Toren. Toren is also pursued by Andrews, and once he kisses her, it's all over. Toren is fine as the gutsy reporter. Paul Frees, one of the great voiceover artists -- who did a great deal of work for Disney -- plays the Radio Budapest announcer. The film was shot in black and white by Burnett Guffey and Ray Cory. Some of the shots, such as a lone man walking toward his possible doom on a dark street, are very noirish. One might call this film a Cold War newspaper noir. 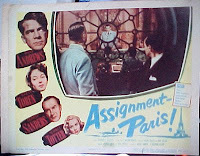 ASSIGNMENT - PARIS was directed by Robert Parrish and an uncredited Phil Karlson. The film was based on a story by Paul and Pauline Gallico. It runs 85 minutes. This film is not available on DVD or VHS. It can be seen on Turner Classic Movies, which has the trailer available here. Update: ASSIGNMENT - PARIS is now available on DVD from Sony. As a final note, one of the film's foreign posters, seen at the top of this post, is quite funny. It portrays a woman in a sultry pose surrounded by cars with headlights aimed in her direction. I assure you there is nothing remotely like that artwork in the entire movie! My favorite Sanders role is ffolliot in 1940's FOREIGN CORRESPONDENT. Oh, I heartily concur. I love when he confronts the bad guys and jokes about selling magazine subscriptions because he's "working his way through college." I love the moment in the car when he describes how to spell his name. And when he jumps out the window into the awning. And...well, he's just all-around great in that one!